Enterprise Tondelli can supply units from 450 cartons per hour up to 4,000 cartons per hour. Carton erection is made by the opening and sealing of preformed case that are then extracted into the required shape. The sealing of the carton can be by self adhesive tape or glue in with the compression either sideways or top compression depending upon the speed. Enterprise Tondelli have a variety of carton sealer models to suit your requirements. 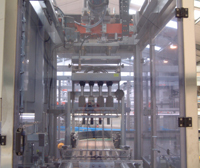 Carton loading is carried out by a pick and place packer. Machine sizes would be from a single head carton loader rated at 450 cartons per hour to an 8 head (Twin lane four head) loader rated at 4,000 cartons per hour and many sizes in between. The machine movement is motorised as this gives greater reliability than using pneumatic cylinders which have higher maintenance. The carton loader can load such diverse products as bottles, cans,shrinkwrapped packs, yoghurt pots, drink cartons/bricks and stand up pouches. Quick change over heads are used with quick release toggles for different formats. We are also able to supply self adjusting heads to reduce the amount of change parts kept on site. Partition insertion can also be added either as part of the carton loader unit ie 2 carton loading heads and 2 partition insertion heads. The partition insertion can also be manufactured as a separate machine and added into an existing line. Carton sealing can be with glue top and bottom or top only. Alternatively tape sealing can be supplied as well. Higher speeds have a rotary carton flap closing device. 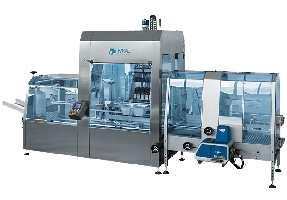 One innovative machine is a carton erector unit monobloced with the loader and sealer to give a very compact and economical machine for up to 600 cartons per hour. Enterprise Tondelli have supplied several units into the UK and European market due to the saving achieved in labour and return on the capital investment. The heads can be quickly changed over making this machine ideal for the slow to medium speed producer.